Idea cellular All USSD code to check balance, offer, plan, alert. USSD stands for Unstructured Supplementary Service Data is a protocol. Idea Cellular is an Aditya Birla Group company, a multinational corporation. This post will give you all USSD code of idea, so that you can track your main balance, gprs balance etc. If you are getting problem in getting idea internet setting in your android mobile do follow the link i.e APN of Idea for Android Samsung, Micromax, Sony. Looking for recharge offer of Idea Cellular. Looking for Activating roaming free for one day in Idea. You may also check My Idea official App, which would be useful to know the balance without ussd code. APN of IDEA for samsung, Micromax, Sony . USSD codes of all network Operators. Note: All codes are tested and are working in Madhya Pradesh zone. There may be some chances that USSD code listed below may not work at your state. (If you know the USSD code, then your comment is always welcome). How to take talktime loan balance in Idea. 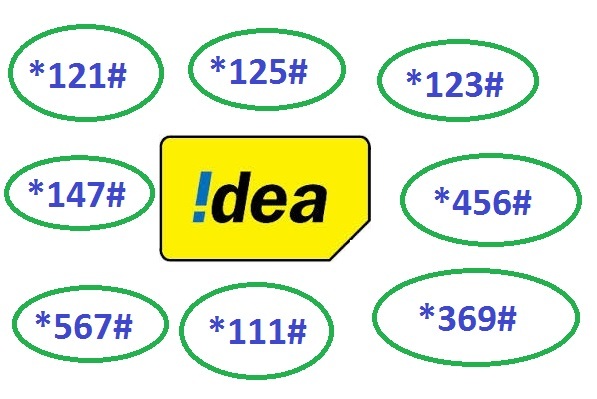 You can also try customer care number of idea, if you are having any complaints etc. To stop all Vodafone service messages and call you can try DND – Do Not disturb, a regulation introduced by TRAI. You can also try Port Service if you are fully unsatisfied with the service provider. If you found any USSD code wrong then do comment below with the correct USSD code with your state name, so that other viewers can also try your suggested code. Hey Sadiq, thanks for providing information as a comment here. Hi to all I’m from Karnataka. How to check Wcdma/gsm net balance for idea network.I ve tried *457# n *125# but I m nt able to get it…..plz help me. To check sms balance *451# is totaly wrong. Try *776# to check it. can u plz send me the sms code to activate mobile data network on my iphone 6 …. How to chk the tariff?? I’m on 1p/sec plan and i wnt to chk its expiry… Any help! I was trying to check my 3G balance but didn’t knew how to do that. This info helped me a lot. Thanks. My nomber no avtivate please . Are yaro ye codes sabhi district me lagu nai hai sabhi ke liye a lag a lag code hi *147# me jakar my acunt me chek kar sakte hai thank you. Pl inform me whether balance in idea 3G prepaid dongal net setter will be carried forward, if I top-up before the expiry date of the existing plan. Sir I have SMS balance but unable to send SMS why?? Thank you for providing info. sir i m using doungle. so i cnt chk my balance data.coz *and #is not able for checking…so plz tell the number. How to transfer my 2g net pack from one mobile number to another mobile number..
how to check internet balance via SMS . How to get value voucher validity. How can I check my Promotional Balance in Idea Prepaid ??? dear sir I am live up east Varanasi zone I share talk time freinds I use *151*mob*amount # &*567*mobile*amount # not working this USSR code please send share talk time ussd code. How to check call minutes consumed out of our plan in Idea postpaid? Sir how to find my offers? idea sim number k liye ussd code????? I’m not able to check SMS balance..
How to check Idea 3G Night balance? *125# won’t work. how I cheak current tarrif plan ??? how to check balance cutter to idea network??? Thanks. I really looking for dnd ussd code to stop calls from idea.. Thanks again. i am a idea customer i recharged rs 15 sms pack but sms not send. sending failed i need help. How to deactiave the sms pack activation in our main balance? I contacted idea customer care, but i dont have a solution for that. I am activated idea 5rs sms pack for 8 days. Afterwards the pack will renewal without any confirmation. I can’t stop this service. How can I deactivate the idea sms pack of 5rs 8days plan.